I have been sick for the past 2+ weeks, which has put a serious damper on my Dinner: The Playbook plan! This cold has really wiped out my energy, plus getting word that my iron levels are low with this pregnancy, has led us to eat a lot of hamburgers and other quick or store-bought meals. But here are a few updates on what I did cook. Note: I served this with a store-bought rotisserie chicken. Cook’s grade: A. Easy peasy. Dave likes broccoli but not cauliflower, and I like both but my stomach isn’t a big fan of broccoli. This was the perfect “meet in the middle” side, and the red pepper flakes gave it just enough punch. Another good side for when you’re roasting anything else in the oven. Kid’s grade: B+. The Bug does not like spicy food at all. She liked eating the little trees until she bit into a piece with a red pepper flake. “Hot! Hot! Hot! Hot! Hot!” We got her to drink some milk to cool her tongue down, and I picked out some pieces without pepper on them for her. But other than that, this would be an A+ for her. Note: This was a second attempt at the veggie termpura, making a few changes, as noted below. Cook’s grade: A-. This isn’t hard to make, but frying anything is labor-intensive and creates a fair bit of stovetop cleanup (even with a splatter shield). I tried a few things to speed up the frying, none of which I would recommend. First, I dumped the veggies and frozen (cooked) shrimp into the batter, then pulled them out one by one. Then I slid the contents of my battered veggie plate into the oil. This, as one can really guess, created a giant veggie tempura pancake, which worked OK, but it prevented the batter from crisping all the way around each vegetable. It was faster, but not by much, and I wouldn’t say the results were worth it. To add some protein, I also used frozen cooked shrimp, which ended up being a little tough. I can’t quite tell if I used the wrong brand or if I should use raw shrimp (I wasn’t sure if 6 minutes frying time was enough to cook shrimp). I want more from the sauce, though. Plain soy sauce just isn’t quite tasty enough for the yummy tempura. Kid’s grade: A-. Bug likes anything with rice and anything she can dip. She ate the veggies but not the shrimp. As Rosenstrach concedes, this is a good recipe for when you have a little more time (it’s in her “keep the spark alive” recipe section). It’s great for a slightly special meal that doesn’t require too much time in the kitchen. Use up your end-of-week veggies, and it becomes a fridge-cleaner recipe PLUS a fancy meal. Use a rice cooker. Even better, use a rice cooker with a timer and literally set it and forget it. You could probably add the rice vinegar to the cooking water. We bought a SodaStream for ourselves for an early Christmas gift, and that makes this recipe so much more accessible. I drink a lot of fizzy water and Dave drinks a lot of soda, but keeping single-serving portions on hand created so much recycling. Since the recipe requires club soda (i.e., unflavored fizzy water), I just use it as an excuse to make a bottle of fizzy water to drink, saving a cup for the recipe. Kid tried? : Sort of. She had a modified version. Kid’s grade: D. She had one bite of “hot dog,” and enjoyed putting her fingers in the mustard, but she mostly ate the buttered peas and corn that I gave her with it. Use a mandoline or–even faster–a food processor to cut the cabbage and onions, and prep is sooooo simple. For extra flavor, I would brown the sausages before then. You’ll be at the stove periodically while the onions are softening, so although it adds another pan for cleanup, it doesn’t really add time to the recipe. I used the Chow recipe for Spicy Roasted Chickpeas, although I mixed the ingredients right in the pan, rather than get a bowl dirty (see previous note about being in an already-semi-clean kitchen). They turned out really well, though I wish I had roasted them a bit longer and maybe waited for them to cool down more before storing them. After a day or two in a Pyrex, they lost some of their crunch. But, the Bug has eaten them a couple of days running, which is a good sign. Inspired, I also made the Cook’s Illustrated Perfect Chocolate Chip Cookies, which live up to their name, even for someone who is as cookie-baking-challenged as I am. I baked the first batch a tiny bit too long, so they were a little crunchy on top. Too hungry for the second batch, I made them in a baking pan we usually use for roasting and cooled them on top of the stove. They flattened out quite a bit, but tasted delicious. 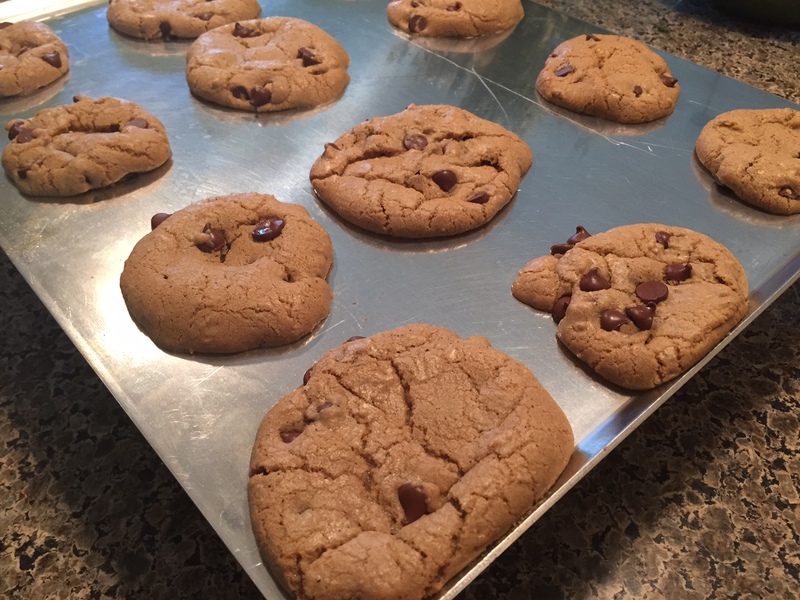 I decided that this year, one of my New Year’s resolutions will be to perfect chocolate chip cookies. The Bug woke up when I was almost done, and helped stir the batter and dump in the chocolate chips (eating a bunch). She had her first raw cookie dough (I know, it has raw eggs, but licking the spoon is one of the joys of baking) and after eating half a baked cookie, had her first demonstrated sugar rush. It was pretty cute watching her dance around the family room with chocolate on her face, clearly buzzing from the little bit of sugar. We’re not sure where this recipe came from (maybe Dave’s Aunt Irene? ), but there are plenty of variations on meatloaf with oatmeal online. Here’s the recipe Dave uses. Chop celery, carrots, and onion into chunks. Put cut veggies into a food processor and process until fine. Mix processed veggies with meat, egg, and uncooked oats in a large bowl. Season with salt and pepper. Transfer to bread pan and cook in over at 400 for 45 minutes or until browned. Aunt Irene recommends sauteeing the veggies before you add them to the meat, egg, and oats. After last week, I was kind of patting myself on the back for all the successes we’ve had so far. But this week is helping bring me back down to earth. On Monday, Dave had a hit with meatloaf with mashed potatoes and our favorite kale recipe, Bitman’s kale with double garlic (here’s a similar recipe that proves you can use it with any green). His meatloaf recipe uses oatmeal, and though he usually uses Quaker Oats, he swapped it for steel-cut oats this time (since that’s all we have). It was soooooo good. Cook’s grade: A. Since Dave made it, I have no idea how easy or hard this was to make, but I do know it was delicious and clean-up was easy. The steel-cut oats added a really nutty flavor that helped it rise above your standard meatloaf. Although, I have to say, I do love even standard meatloaf. Kid’s grade: B. The Bug tried it and ate some–enough to say that it was more successful for her than most of our dinners these days. She ate one bite of mashed potatoes, which used to be a favorite, and one bite of the kale, which is more than she usually tries. On Tuesday, I made pork with cherry sauce, which I had marked in an old copy of Everyday Food. Not exactly a hit, and also a reminder not to cook anything from the more recent issues of Everyday Food. Cook’s grade: C. This was a fairly easy dish to make, and there were plenty of steps to do ahead, which streamlined the actual cooking. It was also very, very simple to clean up. But it just didn’t taste great. I’ve realized that, unless I’m frying something for real–like making fried chicken or tempura–I have no interest in dredging meat through flour and browning it in the pan. It seems like too much work, and I don’t enjoy the taste. The cherry sauce is more of a cherry topping, which was fine with me but disappointing to Dave. I also served it over polenta slices, baked in the oven, and that was not tasty at all. Better to go for creamy polenta or to pan-fry the slices (and maybe use better polenta than the prepackaged Trader Joe’s kind). Tonight’s dinner did not go as smoothly as last night’s. Trying to get the Bug home after the playground is always a challenge (“MORE PAYGROUN!” And then when I carry her away: “MY WALK!”), but when it’s a playgroup playground day and she’s getting hangry (I swear, she’s going through a growth spurt now in addition to getting her two-year molars), it is no fun. Pair that mad dash home with a fussy toddler who doesn’t want to hang out with Daddy, leaving him little choice but to stand directly behind me the entire time I am cooking, and it does not create an ideal cooking situation. Also, I HATE IT WHEN PEOPLE WATCH ME COOK! OMG I HATE IT SO MUCH! So, yeah, not ideal. I did remember to take a phone photo, though, so there’s that. Cook’s grade: B. So, when I started this whole project, Dave said, “You used to cook all the time. Why don’t you just start making the recipes you used to make?” To which I responded, “I have no memory of what I used to make.” He, helpfully, reminded me that I took a lot of photos of food I made. (Many are probably on this blog somewhere.) This was one of those old standbys. My coworker Jen recommended it to me and it became a staple, until I decided that the prep was too arduous. Peeling and cutting a butternut squash into 1/4″ dice? AGONY! But I decided to break down the prep, cutting the squash last night and then during the Bug’s nap today, and it was much easier. Though, still only good for a week when you have time to prep a meal. The actual cooking is dead simple: one pot. See more notes below. Kid’s grade: B. 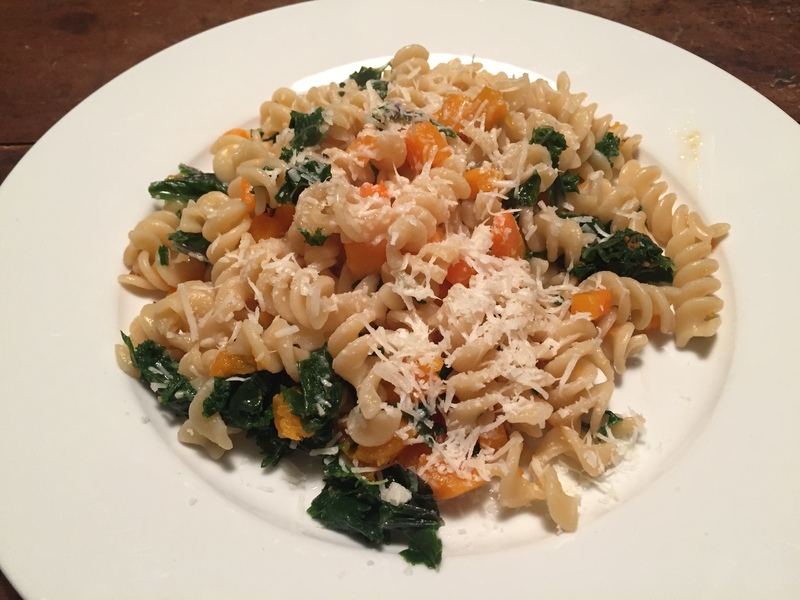 It involved pasta and cheese, so she liked it, and I think she would have liked the squash (which she normally does like), but she was fussy toddler tonight. Do all that, and the cooking is easy peasy. Minimizing clean-up has to do primarily with pot management. Drain the squash, then put it back in the bowl you had the raw squash in. Drain the pasta and leave it in the colander. Eyeball the olive oil, butter, garlic, and stock so you don’t have to clean measuring spoons/cups. More veggies, less pasta. I didn’t notice until after I cooked the whole bag of pasta that you’re only supposed to use 8 oz. Oops. Use homemade chicken stock, if available. We use boxed, and the flavor is often…subtle. You could also put more stock in and boil it down longer, but this adds to the cooking time. Use more cheese than recommended on the warm pasta. Be generous with the salt and pepper. Extra credit: cook the squash in the chicken stock. This will double the number of pots, but also reduce the cooking time since I could start the kale and squash at the same time. OMG! Tonight’s dinner was a huge success! I started it at 4:10 pm, put the veggies in the oven at 4:25, put the chicken in at 4:30, and left to get the Bug at 4:45 after quickly basting the chicken and shaking the veggies. Dave took out the chicken and Brussels sprouts at 5:00 and the rest at 5:15, and he even had dinner on the table waiting for us when we got home. And for cleanup, we had one pot, one baking dish, and one roasting pan. This was pretty much a dream weeknight meal. Cook’s grade: A+. This used to be in my standard repertoire because it was an easy way to make tasty chicken, but in the interest of eating less food with goop on it, I phased it out. Dave reminded me of it, actually, and it was as simple to put together as I remembered. The sauce has three ingredients that don’t even need to be measured carefully–approximate amounts are fine. As I boiled down the sauce, I peeled and cut the veggies for the roast veggies (see below). However, after pouring the sauce on the chicken, immediately put water and soap in the pot. Otherwise, it is a bear to clean. I do a combination of thighs and breast, since Dave prefers white meat. Kid’s grade: A+. The Bug will eat any meat with goopy sauce on it. Dave will often give her BBQ sauce with her chicken to encourage her to eat it, but I just can’t bring myself to do that (at least, not more than once a week). Knowing exactly what went into this sauce, I felt better about it. She ate the sauce first, then a few bites of chicken. Then, as usual, when she saw the dogs eating dinner, she became interested in her own dinner again and finished up the chicken and asked for more! This has not happened with meat in a long time. Cook’s grade: A. An issue of Martha Stewart Living a while back recommended roasting veggies whenever you have something else in the oven, and I used to be better about this. It’s a great way to use up any root vegetables that are lying around, and since root veggies last a long time, it’s kind of worth keeping a few on hand. It’s also a good way to expose your kid to a few “new” veggies. I roasted a parsnip, red potatoes, shallots, and Brussels sprouts, pulling the sprouts out after about 45 minutes and leaving the rest in for about an hour. Our roasting pans are well used, so they never quite come “clean” anymore, but beyond that, which is our own issue, clean-up was fairly easy. Kid’s grade: B. When she thought the parsnip was apple, she was willing to try it, but she was not willing to try something that was “like apple.” Nor was she willing to try the potato. After an initial “no like” to the Brussels sprouts, I told them they were little trees and, giggling, she tried a few “leaves” off the trees. Then I looked over and she had popped one in her mouth and ate it all. Considering veggies have been a hard sell the past few weeks, I consider this a success. If you’re in a rush, prep the veggies while the sauce cooks down. That buys you 15 minutes. Choose veggies that don’t require peeling. I peeled the parsnip and shallots, but not the potatoes. I cut the shallots in quarters and cut everything else in smallish but not terribly small pieces. You can skip basting the chicken. If you’re cooking a breast, the sauce might slide off it a bit, but it won’t ruin dinner. If you have a child who is sensitive to “hot! hot!” food, as mine is, put the veggies in, then the chicken 15 minutes later. You’ll be at the oven every 15 minutes for an hour, but the hottest food will have time to cool down before it gets on the table. It bears repeating: put hot soapy water in the pot and baking dish as soon as you take the sauce/chicken out. It makes cleanup so much faster. Kid tried? : No, but she was curious about it and fed some to me. Cook’s grade: A. Super easy way to change up my old standard broiled salmon recipe. We did not have Sriracha, so I made it with just the miso, maple syrup, and soy sauce. I overcooked the thicker filet, but the thinner one was perfectly done and the glaze was really, really tasty, adding just enough flavor without overwhelming the fish. Kid’s grade: Bug abstained from voting. Cook’s grade: A. Simple way to get some yummy flavor with green beans. Reminded me of my favorite way to cook kale or other greens (kale with double garlic, from How to Cook Everything). Kid’s grade: B. Bug tried one green bean, but even though she has an almost-full set of teeth at 21 months, I think they might have been too crunchy for her little chompers. She did love the rice I served with the salmon and green beans. I realize these posts would be more helpful with photos. I’ll try to take some of future meals. Right now, I’m just proud of the accomplishment of getting dinner on the table, period. Edited 1/7/15 to correct the dates of the meal.